Have you ever tried freezer cooking? I’ve had a meal or two in my freezer and when it came time to thaw it out and serve it, I was always freaked out that it wouldn’t taste at all remotely like it was supposed to. I also had this fear of us sitting down at the dinner table and biting into the center of a cold hard enchilada or a plate of food that tasted like those TV dinners from the 80s. Out of desperation to gain control of the 5 o’clock meal hour and our grocery budget, I’m trying something new. Yep, you guessed it. Freezer cooking. I’m not usually a baby steps kind of person. I’m more like a dive in completely without thinking about anything or anyone kind of person, but I’m taking baby steps when it comes to this little project. I started by purchasing a book I’ve heard really good things about. 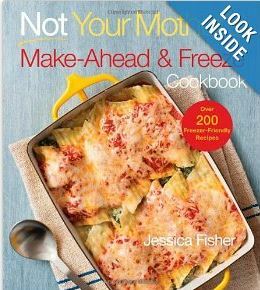 It’s called Not Your Mother’s Make-Ahead and Freeze Cookbook (NYM Series) . I chose a few recipes, went shopping this past Saturday and am making two of everything I prepare for dinner this week. One we eat, one I freeze. I want to test the recipes first to make sure we like them. Imagine having a freezer full of meals your family doesn’t even like? Um, no thanks. I also want to make and freezer meals I already make on a regular basis that I know my family enjoys, but I wanted to expand my knowledge on what kinds of dishes freeze well and which ones don’t. How’s it going? So far, so good. Saturday we had beef enchiladas. They were really, really good. We now have a pan of enchiladas in the freezer. (I adapted her cheese enchiladas. I cooked some hamburger meat in chopped up onions and garlic, added some salt and pepper and added that to the recipe.) Sunday we had Teriyaki Chicken Skewers. We now have a Ziploc bag of these already in the sauce ready to go in the freezer. That’s two meals in the freezer. How do I feel? Liberated, organized…like a dog gone supermom. I don’t plan on being one of those once a month cooking types because of several reasons. I still love the idea of preparing a fresh meal and our schedule isn’t that jammed pack in the evenings that I can’t do that. But I do plan on having around 10 meals int he freezer. Maybe 18. Who knows! This is new to me! Also on the schedule for freezer cooking this week is Cinnamon Banana Bread and Chocolate Chip Cookies. Yummy. Please look through the Table of Contents before you purchase. She lists all of the recipes in a sneak peek of the book right there for your very eyes. You can see exactly what recipes (and how many meat and meatless dishes) are included. You can read more about this book and order your own here. The Kindle edition is only $2.99 today!! Have you tried freezer cooking? If not, is it something you’re interested in trying?